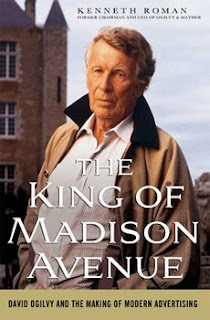 What got me thinking about creative standards was reading the charming, lively and useful biography of David Ogilvy, The King of Madison Avenue, by Kenneth Roman, a former CEO of Ogilvy & Mather. What impressed me most about Ogilvy’s involvement in the creative process was not his own copywriting – Roman tells me that Ogilvy had a dozen years of generating solid ad copy, but then took to calling himself “an extinct volcano” – but how he became the yardstick of quality. “I agreed that the fix made sense but pointed out that this was not the main campaign, only a coupon ad, and this was just a test market. The change could be made later. ‘And the client has already approved it,’ I added. “The reproving response was swift. ‘David says (pause) it’s never too late to improve and ad – even after the client has approved it.’ ‘Spend the 300 bucks,’ I agreed. Like the Church, the agency had standards. So Ogilvy was charming… AND demanding. A lovable tyrant. Like many of the best leaders, he was feared in the best way – the employees didn’t fear him, they feared letting him down, feared failing to live up to his standard’s and the agency reputation. We all need that fear, especially in an economy that is so bad it can scare the good fear away. It’s tempting for managers to try to make up for tough times by being soft, by being cheerleaders. But the best bosses understand that this is no time to go smiley-facing mediocrity. If you have a quality tyrant where you work, be grateful. If you don’t then it up to you to ask yourself the hard questions and to know when the right answer is that you’re wrong… Quack, quack.